Roundup weed and grass killer is the most widely used herbicide in the world. Manufactured by Monsanto Company, Roundup is used commercially on farms and fields and by consumers on their lawns and gardens. The main ingredient in Roundup — called glyphosate – was determined to be “probably carcinogenic to humans” in March 2015 by the International Agency for Research on Cancer (IARC), part of the World Health Organization. Drawing on published reports in scientific literature from independent researchers, IARC specifically linked exposure to Roundup and glyphosate to non-Hodgkin lymphoma (NHL) and several other blood cancers, including B-cell lymphoma, a subtype of NHL. IARC’s assessment that glyphosate “probably” causes cancer in humans is significant because farmers and agricultural workers are not the only ones at risk for exposure. 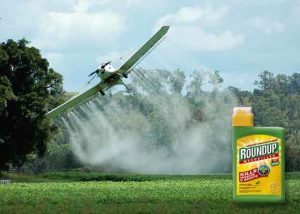 Residue from Roundup’s main ingredient glyphosate can be found in the air we breathe, the water we drink and the food we eat. Roundup was introduced by Monsanto in the 1970s and has been used in home gardens ever since. It has also been used widely on crop fields and farmland, especially after Monsanto introduced Roundup Ready soybean and corn seeds in 1996. These seeds were genetically engineered to be resistant to Roundup’s powerful weed-killing properties, meaning farmers could spray Roundup directly on Roundup Ready crops during the growing period and only the weeds would be killed. Since 1996, Monsanto has introduced Roundup Ready corn, soybean, canola, alfalfa, cotton and sugarbeet seeds, and more seeds are in production. Today, soybean, corn and cotton make up the majority of all herbicide-resistant crops grown in the United States, and Roundup Ready crops make up the vast majority of these crops. Monsanto and other agricultural biotech firms claimed genetically engineered crops resistant to herbicides would reduce the use of pesticides overall, but that has not been the case. According to a study conducted by Dr. Charles Benbrook of Washington State University, an additional 500 million pounds of herbicide was used in the United States between 1996 and 2011 because of the advent of herbicide-resistant crop technology. Most of the additional 500 million pounds of herbicide used was Roundup. Roundup is a potent and potentially dangerous product that has been linked to serious blood cancers by an international agency and numerous studies published in the past two decades. Dozens of studies have been published since the late 1990s analyzing the safety of glyphosate, the main ingredient in Roundup. Many of these studies link the weed killer to a deadly form of blood cancer called non-Hodgkin lymphoma and its subtypes. A 2002 study published in the journal Leukemia & Lymphoma pooled results from two case-control studies and found people exposed to glyphosate were at a three-fold increased risk of developing NHL or a rarer subtype called hairy cell leukemia. A 2003 study published in the BMJ’s Occupational and Environmental Medicine pooled data from three case-control studies of NHL conducted in the Midwest by the National Cancer Institute in the 1980s. The study found that men who lived or worked on a farm as adults had a 10% increase in risk for developing NHL compared to men who did not. The study also found that exposure to glyphosate in particular doubled these individuals’ risks for developing NHL. More recent studies have also linked glyphosate to an increase in risk for NHL and its subtypes. A Swedish study published in 2008 in the International Journal of Cancer found exposure to glyphosate increased a person’s risk for developing NHL by more than double and increased a person’s risk for developing a subtype of NHL, called B-cell lymphoma, by 87%. In 2014, a study published in the International Journal of Environmental Research and Public Health found people exposed to glyphosate at work had a two-fold increased risk of developing B-cell lymphoma. Even a study sponsored by Monsanto, published this year in the Journal of Environmental Sciences and Health, found a 40% increase in risk for B-cell lymphoma and a 30% increase in risk for NHL when exposed to the herbicide. The authors of the Monsanto-sponsored study were quick to point out that no “causal relationship” has been found between glyphosate exposure and NHL, meaning they could not necessarily prove it was the glyphosate that caused the increased risk in NHL or its subtypes. Many of these studies found a dose-dependent relationship between exposure to Roundup and the development of NHL. This means the more Roundup people were exposed to, the more their risk increased for developing NHL. Individuals harmed by Roundup may be able to seek settlements in the form of a Roudup Lawsuit. If you or someone you love was exposed to Roundup and were diagnosed with non-Hodgkin lymphoma or another blood cancer, you may be entitled to compensation. The legal team at Hood National Law Group is ready to answer your questions and help you determine if your case qualifies for a Roundup Lawsuit.